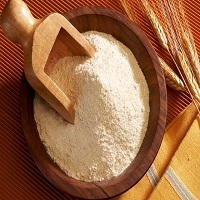 Wheat flour is a powder made by crushing the wheat used for human eating. The amount of wheat flour produced is the highest as compared to any other flour. There are varieties in wheat. If gluten content is low then they are called "soft" or "weak" and if they have high gluten content then they are called "hard" or "strong". The matter of concern is that there are cases of adulteration of wheat flour with maize and rice flours. But, Bacterial and microbial adulteration of wheat flour has not often been a matter of concern due to the fact that it contains low water activity level.